Rotafix Consolidating Liquid consists of 2 liquid components which when mixed together will produce a low viscosity unfilled epoxy system suitable for the repair of damaged timber sections allowing existing timber features to be maintained. Rotafix Consolidating Liquid Slow set is used to reconstitute friable timber that has been impacted by insect attacks or decay making creating solid beams and surfaces to allow timber to be bonded on attached. 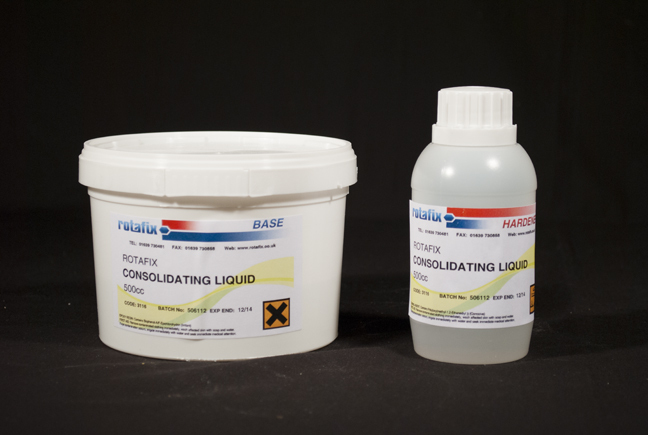 It is common to use Consolidating liquid prior to making a repair or connection using Rotafix TG6 to give you a solid run free structure to contain the very searching Rotafix TG6. Rotafix Consolidating liquid has a low viscosity so it can be poured, brushed on or even injected into fine splits and shakes.